Release of the New Atomic Resolution Analytical Electron Microscope "NEOARM" (JEM-ARM200F) | News Release | JEOL Ltd.
JEOL Ltd. (President Gon-emon Kurihara) announces the release of a new atomic resolution analytical electron microscope, "NEOARM" (JEM-ARM200F), to be released in June 2017. The transmission electron microscope (TEM) equipped with a spherical aberration corrector (Cs corrector) has now become a De-facto-standard instrument in cutting-edge research sites. JEOL, up until now, has supplied spherical aberration corrected TEMs (Cs-corrected TEMs) as many as approximately 200 units all over the world. In recent years, various needs of high-resolution imaging for materials containing light elements and specimens susceptible to electron-beam irradiation are increasing. In addition, with increased use of Cs-corrected TEMs, high demands for simple operations of aberration-corrected TEMs are accelerating. 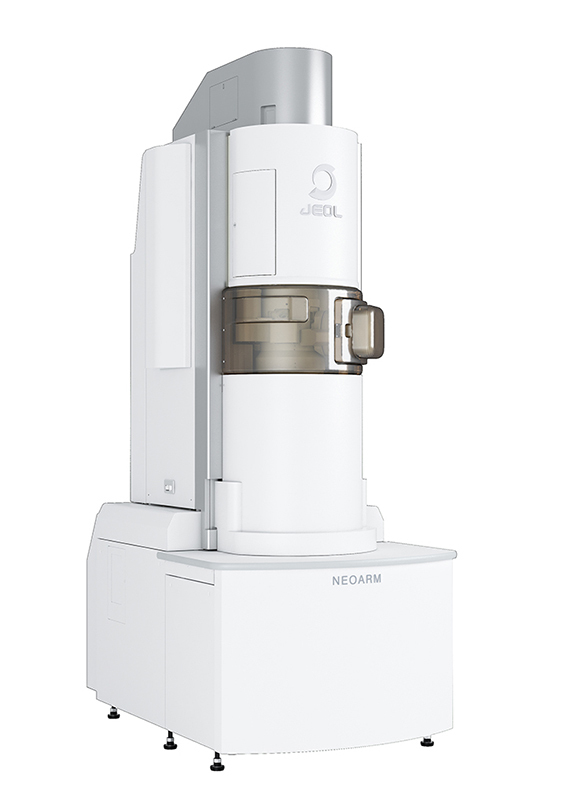 To meet those diversified needs, JEOL has developed "NEOARM" atomic resolution analytical electron microscope. "NEOARM" comes with JEOL’s unique cold field emission gun (Cold-FEG) and a new Cs corrector (ASCOR) that compensates for higher order aberrations. The combination of a Cold-FEG and ASCOR enables atomic-resolution imaging at not only 200 kV accelerating voltage, but also a low voltage of 30 kV. "NEOARM" is also equipped with an automated aberration correction system that incorporates JEOL’s new aberration correction algorithm for automatic fast and precise aberration correction. This system enables higher-throughput atomic-resolution imaging even at low accelerating voltages. Furthermore, a new STEM detector that provides enhanced contrast of light elements is incorporated as a standard unit. Contrast enhancement of light elements is achieved by a new STEM imaging technique (e-ABF: enhanced ABF), facilitating observation of light-element materials. The microscope room is separated from the operation room to respond to a remote operation. In addition, JEOL products’ new concept color of "pure white" is adopted, leading to a sophisticated exterior design of "NEOARM". ASCOR incorporated in "NEOARM" can suppress the six-fold astigmatism which limits resolution after Cs correction. The combination of ASCOR and a Cold-FEG achieves higher resolution than ever, over high-to-low accelerating voltages. JEOL COSMO™ adopts a new aberration correction algorithm (SRAM: Segmented Ronchigram Auto-correlation function Matrix). Thus, no special sample is required for aberration correction, leading to high-precision and quick correction of higher order aberrations up to 5th order. This system enables fast processing compared to the conventional correction algorithm and also automates the operations, thus eliminating a complicated correction workflow in the customer microscope. These features enable higher-throughput atomic-resolution imaging. The ABF detector is widely used as a technique suitable for high-resolution imaging of light elements. "NEOARM" supports enhanced contrast of light elements by a newly-designed ABF imaging technique (e-ABF：enhanced ABF). This capability facilitates atomic-level structure observation of materials containing light elements. The perfect sight detector, integrated into "NEOARM", uses hybrid scintillators. This detector always enables the acquisition of high-contrast and quantitative STEM images, irrespective of accelerating voltage values. Viewing Camera system, intended to be used for remote operation, is an image observation system that uses a dual camera. This system allows for remote operations in a room separated from the microscope room and also enables a smart exterior designing of the "NEOARM".